This is the first article in a series that I'll be writing discussing my approach to composition in photography. This is the first post on this new Blog section of my website. Photographic composition is a subject that all beginners and many intermediate level photographers find difficult and I thought I'd start this blog by discussing my own approach to composition in some depth in a series of articles. The main things that I look for myself when I'm composing an image in the viewfinder of my camera are simplicity and balance. In this article we will be discussing the subject of simplicity and in future articles I'll be talking about how to achieve a feeling of harmony in your photographs by balancing the various elements. 'KISS' is a well known acronym which stands for 'Keep It Simple, Stupid' and is a guiding principle used in many branches of art and design. When I first became interested in photography I spent the first 6 months or so taking photos that were little more than snapshots. I was really struggling to take any photos that had any artistic merit. Gradually, however, I evolved a simpler and simpler approach to composing my photos in the viewfinder which had the effect of strengthening the impact of my photos by making them less cluttered and messy. It also had the happy side effect of making it easier to get good balance across the differing elements in the photo. I've since come to the conclusion that simplicity in photographic composition is fundamentally a difficult concept to grasp for beginners. The reason for this is that many beginners to photography don't realise that the scene they are looking at through the viewfinder of their camera just before pressing the shutter button is NOT the same as the identical scene viewed without a camera just using our eyes. The reason for this is that the visual signal picked up by our eyes is naturally filtered by our brain processes to remove most clutter and irrelevant distractions - it's just a natural part of the way that our eyes and brain work together to process information. In 2010 I gave a talk to other members of my local camera club and showed them this video. We did a quick count after they had watched it and about half the people in the room admitted that they didn't see the gorilla. What was happening while they watched the video was that they were concentrating on the people passing the ball and their brains simply didn't register the gorilla entering the room. Its interesting isn't it but how does this apply to composition in photography? Apart from this demonstrated tendancy that we have to ignore unwanted visual clutter our brains will also try and impose a sense of order into the visual signal being received via our eyes - an order that might not be at all obvious if we photographed the same scene and then studied the resulting photograph. A camera faced with the same view is indiscriminate and will record everything down to every last distracting and irrelevant bit of detail - the result if we are not careful is a cluttered and dissapointing photograph that never seems as powerful as our own memory of the scene. Well, one method that I find helps a lot is to think about photographic composition as an reductive process rather than one of addition. This is an approach that I use all the time - when I'm composing a photo in the viewfinder of my camera I'm usually making a conscious effort to exclude anything from the photo that is not central to the theme of the image. 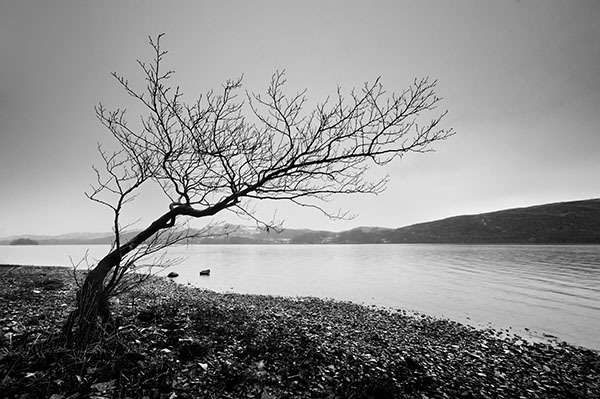 The lone tree like this one that I photographed leaning out toward the lake at Coniston in the English lake District is a classic theme in fine art photography and it has been used by many famous landscape photographers because it is always powerful. The secret to it's power lies in it's simplicity. As you gain experience as a photographer you will find that you are able to apply the same principles of simplicity to more complex scenes. For example groups of trees are always harder to photograph than individual trees yet it's still possible to achieve a simple strong composition if you are lucky as I was in this scene below from the edge of a forest in Yorkshire which I took on a misty November morning in 2009. 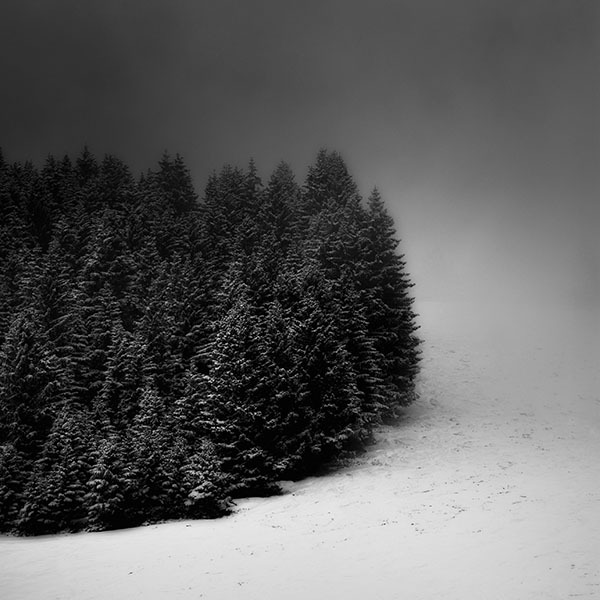 .....or this photo below of a lovely group of trees in the snow of the French Alps. The mist in both of these photos really helps with the simplicity and power of the composition as it effectively excludes any possible distractions that there might have otherwise been visible in the backgrounds of those two scenes. We live in such a fast-moving and complex world yet I get great personal enjoyment and a fantastic feeling of inner peace when I'm able to get out with my camera and take photographs like these that are simple and full of balance and harmony. I hope that you have found this article on simplicity in composition interesting. Hopefully, if you are a beginner to photography or have been struggling with the composition of your photos, this article will have helped you on the road to making improvements that will bring you greater enjoyment from your photography. 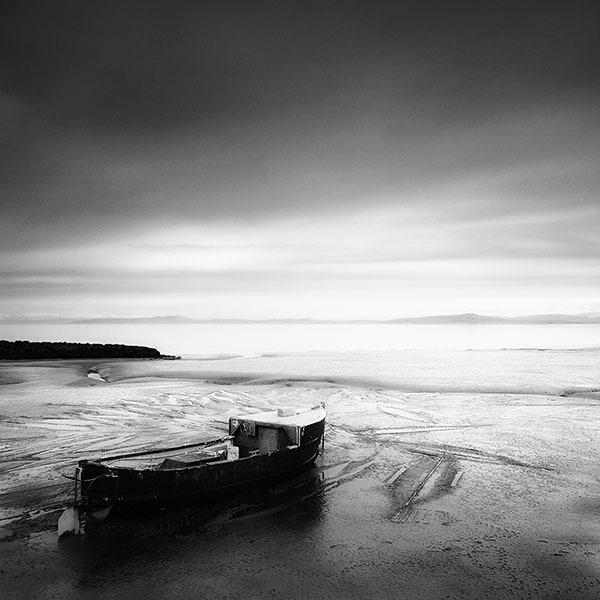 My next blog article will cover the importance of balance in composition. "An excellent article, Ian (not that I'd expect anything less from you). My personal approach is very different nowadays, but what it is now wouldn't be possible without first going through the most important basics you are explaining so well. Seen too many bland photos composed and cropped according to all the rules in the book..."
Thanks Alex. I still remember vividly the huge frustration that I constantly felt when I first took up photography. The process of improvement was such an agonisingly slow and tortuous one and if I can help any others out there who feel they are struggling by writing the article then it's worth doing. "You've put a lot of thought into that article Ian, and it was very well written. Alex, regarding your thoughts, of course the standard guidelines of composition can be taught to anyone with a capacity to learn. Beyond that though - being able to take the standard guidelines and apply them in your own unique way, or twisting them, or reversing them, or reorganizing them to suit your way of seeing is something not everyone can do (i think). I very rarely (probably almost never) think in a technical way. Regarding composition I always just go by feel. My thinking when composing something is less like organized blocks that must be stacked properly, more like an energy that is very fluid, that I try to harmonize." Hi Matt, thanks for the comments about the blog. I agree with you that development past the basics of composition to the progression of an individual style is a big leap but all the great photographers you and I can list all started out as beginners without a recognisable style. Given enough passion, time, experimentation and practice I'd have thought that it was possible for any beginner to eventually develop their own way of seeing the world and then recording it through photography. The point you make about composing intuitively is very good. I do that too now but I didn't as a beginner. It's like learning to drive a car - with practice it gets to the point where you no longer have to consciously think about what you are doing. "Great article Ian. Perhaps it is where I am at in the learning curve, but it really resonated with me...Like a fine piece of music with a repeating simple theme, some of the best written. Look forward to your next writing." Hi Hillary! I'm really pleased that you enjoyed that article and that you found it useful. "Thank you for your time and effort. It is very interesting to see how your mind works. Will help me enjoy your work even more." I can completely relate to the frustrations you have mentioned since I'm still going through them. I often get very excited to capture "the atmosphere" or "the surroundings" and end up catching a bit too much. Interesting thing is, that despite being aware of my problem - my intuition still makes me do the same thing again and again! I'll keep your words in this article in mind the next time. Awaiting your next article on balance and harmony. Btw, in case if you can add a feature to subscribe to your blog - shall be of great help since that shall notify the subscribers when a new post arrives! Thanks for that Punit and I'm pleased you thought it was useful. I'll post the follow-up article on balance in the next few days. Re your comments about adding a feature to allow subscriptions: I've added this now as a button at the head of the page but it's not something I've used personally so if it's not what you were after let me know and I'll alter it to suit. Hi Ian. I must admit, I have really enjoyed reading these articles on your webpage about Photographic Composition. I remember reading them, a couple of years back, when you were writing them, and following them then, I found it so hard to begin with, photography is about learning to see again! I find 'Emotion' the hardest one to define, or understand, I guess it's a personal thing, I guess that black and white photography lends it's self or gives the feeling of depth, light all kinds of thing, I love B/W photography. I think the write ups on Balance/Light and Form/Frame Edges I can relate to now, it's very hard to begin with, a real learning curve! At fist I could not understand, it seems a lot to take in, but slowly but surely through a lot of hard work, and effort you start to get somewhere. The best bit of advice (I'm sure it's in among the articles somewhere) is to think hard about composition, and do your editing through the viewfinder, it seams obvious really, but it's to do with thought about the image you are after, I tend to shoot with the camera in portrait mode for instance if I'm thinking of a square crop, that way you can compose the shot your after much better. The KISS technique, again I found very interesting, it's so hard at first, the less is more idea is difficult to grasp, it's kind of like editing (again) through the viewfinder, removing distractions at that stage, and thinking about composition at that stage, then post production (should) be easy, as you have made it that way. I'm sure I'll come back to re-read these again, it's great that you have written them, they should be in a book or something, I found them so helpful. I have really enjoyed your Prague images, what a wonderful place, the Charles Bridge shots in particular are stunning. I have had some of my shots published in this months 'What Digital Camera' , I was a bit scared how they would reproduce, but they came out ok thankfully.